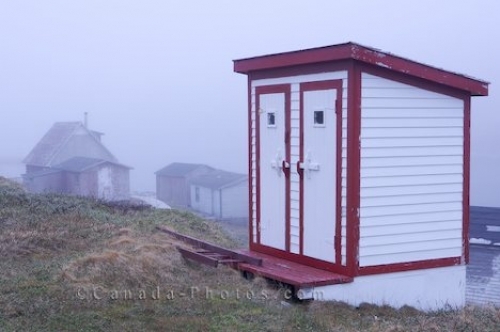 Fog encompasses Battle Island in Southern Labrador, Canada, but arising out of the mist is an outhouse which sits along the water's edge outside the Church of St James the Apostle. On Battle Island you will find many heritage buildings that were commonly used when this island was a booming fishing community. Outhouse Battle Harbour situated on Battle Island at the entrance to the St Lewis Inlet, Viking Trail, Trails to the Vikings, Southern Labrador, Labrador, Atlantic Canada, Canada. Picture of an nicely painted outhouse used by church members on Battle Island in Southern Labrador, Canada.